Courtesy of Historic Oregon Newspapers. With the addition of so many newspapers to online databases, it’s been illuminating to page back through time to see so much of our ancestors’ everyday lives. 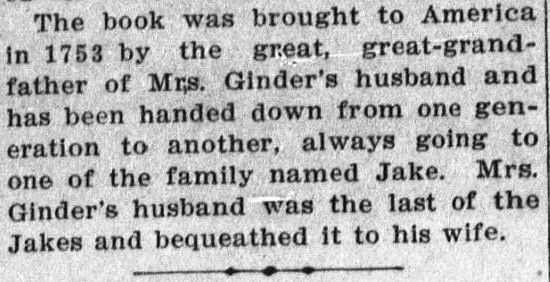 For me, one of the more curious people encountered ‘in the news’ has been my maternal great-great-grandfather Jacob Ginder (1837–1901). Jacob’s roots are unusual in my standard array of westward migrating New Englanders. Jacob’s origins are from mid-Atlantic Quaker stock, the kind you can follow backwards from Iowa to Virginia in the 1700s. 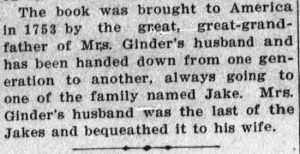 Jacob Ginder married Hazel Norwood later in life so they had no issue. Because of this Hazel has remained almost a footnote in my family tree. 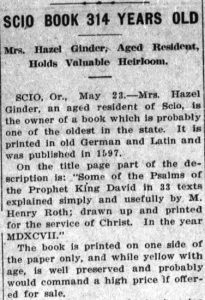 However lately, I’ve been concentrating on Jacob’s generation, that of my great-great-grandparents, and while researching in Oregon’s Historical Newspapers, I stumbled upon an article about Hazel and a book that Jacob had left behind for her. So whatever became of this book? Part of me likes to think that maybe Hazel sold it – that she had to sell it to support herself after Jacob died, and that even as sad a notion as the sale of this family heirloom is, that it was a good thing, since it was all Jacob had left in the world to leave his wife. The other part of me says, “Where is that darn book?” Now I know that Jacob couldn’t ‘over night deliver’ it back to any one of the many girls in the family named Martha in 1901, but surely he could have left word? After all, his family had carried this book over the sea and across America since 1753 – with the book being nearly 200 years old then! It just doesn’t seem right somehow. I am going to err on the side of hope – a hope that the book didn’t just get thrown away when ‘they’ cleaned out Hazel’s lodgings; though more than likely this is exactly what happened. Indeed, it is very sad that a book which had traveled with my family since the year 1597 might have ended up being nothing more than early-twentieth-century Oregon land fill. [i] Oregon Gen Web, submitted by Dorothy Keefe, from a compendium of biographies hand-typed and distributed by the East Multnomah Pioneer Association in about 1972, pp. 129–31 for a discussion of the life of Frances Ginder Neely, daughter of Jacob and Martha Lacey Ginder; U.S. Federal Census Records 1800–1900, Iowa and Oregon, for the residence of George A. Ginder, son of Jacob. [ii] Multnomah County, Oregon Marriage Index, 1855–1911, Ancestry.com. [iii] Newspapers.com, Statesman Journal (Salem, Oregon), 31 March 1899, p. 3. [iv] Newspapers.com, Statesman Journal , 31 May 1903, p. 8. [v] Historic Oregon Newspapers, Capitol Journal (Salem) 1919–1980, 25 January 1922, Image 7. [vi] Historic Oregon Newspapers, Polk County Observer (Monmouth, Oregon), 26 May 1911, Image 4; Newspapers.com, Albany Evening Herald (Albany, Oregon), 24 May 1911, p. 6. Jeff, so nice to see someone from the West Coast contributing to Vita Brevis. I have received these for many years and enjoy reading them, gleaning new insights into my own searches. Also a member of the Mother Lode Colony! Great job, looking forward to more of your posts. It might be interesting to have someone weigh-in who knows the history of religious book translations. The 16th century is when the Old and New Testaments were being translated from Latin to German and English. I imagine a German language Book of Psalms from 1597 could have been a very early non-Latin version, and perhaps more like a hymn book than a prayer book. What a curious thing to find mentioned in a newspaper. Hmmm, as a Salemite myself, here are some suggestions of places the old book could have possibly ended up: Willamette University in Salem, which was founded by Methodist missionaries and would have been a likely institution to receive such an offering; Willamette Heritage Center, which is across the street from the university at 1313 Mill Street SE. Could also be worth checking with the University of Oregon’s library in Eugene, or the Oregon Historical Society in Portland. Pamela, many thanks for these clues as to where else to look! Here is an article which is SO CLOSE to what you’re looking for…and yet not it. Forgot to mention the Oregon State Library, also in Salem. No telling where it might have landed (outside of a dumpster). Quite fascinating! Perhaps your ancestor’s 1597 book is still around somewhere — but if not that specific copy, there are probably other copies of the same volume floating around somewhere, most likely in a university’s rare books collection. Since Roth died in 1575, your ancestor’s 1597 edition must have been one of those published by the Archdeacon Petrus Lagus. Perhaps this information can help you track down your ancestor’s book, or another copy of it at least. P.S. I believe the initial “M.” in “M. 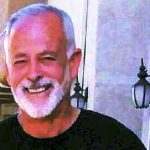 Heinrich Roth” stands for “Meister,” that is, a credentialied teacher with a master’s degree — in this case, probably in theology and related areas of knowledge. P.P.S. The Martin-Luther-Universitaet Halle-Wittenberg Universitaets- und Landesbibliothek Sachsen-Anhalt online collection (http://digitale.bibliothek.uni-halle.de) shows five volumes of Heinrich Roth, printed in the years 1566, 1578, 1581, 1589, and 1594 respectively. The 1594 volume is “Aus dem 79. Psalm” (From the 79th Psalm) mentioned in Grimmsmann’s book. None of these five volumes is a copy of the title owned by your ancestor, but the digital images at least show what such books look/looked like. On that page, click on the “Heinrich Roth” hyperlink to see the other four volumes I mentioned. Jared, I am most grateful for your efforts and for this great information. Many thanks for your kindness! He was indeed a “magister” or meister, with a degree in theology and pedagogy. Looks like his name was spelled quite a few different ways, “Henricus Rhodius,” etc. I wonder how it was spelled in Jacob’s 1597 book? A search of World Catalog for “Roth” and “1597” turned up 2 copies, neither in Oregon. The nearest to you (and me) is the Lutheran Seminary Library in St. Paul, MN. There is no information in the listing how or when they acquired the volume. Email them. The other copy is at Universitätsbibliothek Leipzig, Bibliotheca Albertina, Leipzig, 04107 Germany. Clearly, as the other poster above listed, there are other copies out there that are not in World Catalog as of yet, so checking in with those possible holders would be a good idea indeed. Also, I checked ABE, which again does not encompass all used booksellers, ESPECIALLY those who deal in pre-1700 volumes. Directly consult with a Rare Book Dealer in your area as to who these might be in the US. Books that survive move around. Using versions of Roth, Heinrich Roth and the date, I came up with zero results. There is a Heinrich Roth who was writing on educational learning in Germany in mid-20th century, but obviously not your HR. 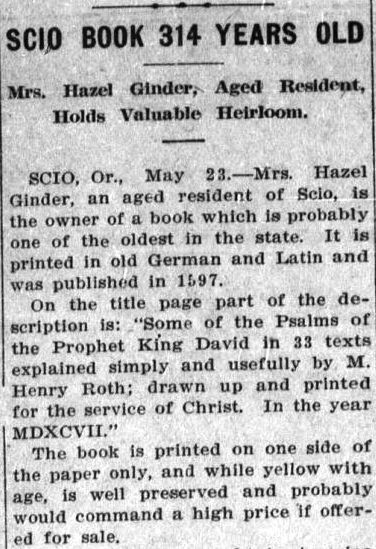 The odds are pretty good that Hazel sold this book shortly after the article appeared in 1911. One of the reasons the article appears is that it is a Good Story, rather like the survival/find of a 17th century notebook on Shakespeare’s plays on the UK Antiques Roadshow. And, too, it is Free Advertisement, likely just as Hazel intended. She may not have gotten a positive response from the immediate Salem area dealers or she hadn’t approached anyone yet. This notice/story would have put the book “in the market”. Today, she’d have eBayed it! Perhaps not your book, but others like it are “out there”. Alas, usually the current possessor has no idea what they have, and if they decide to give it to a local thrift shop, those people equally have little to no clue. A LOT of original genealogical documents end up at these places being “AS-IS”ed. So, if you have original family documents, make it a point to gift them to an institution, gift them to a family member with the provso they go after that to an institution (and send that place copies), or sell/eBay them because the purchaser will protect them until he/she sells them. Robert, thanks for your help! This story reminds me of the one about the discovery of Johann Sebastian Bach’s family Bible in Michigan.